On Monday, Aug. 21, people from Oregon to South Carolina will get to experience a rare total solar eclipse, with folks outside this path still experiencing a partial eclipse. And because every notable event must be accompanied by a marketing bonanza, there is no shortage of companies offering everything from eclipse-themed appliance sales to one-day-only donuts. We’ve rounded up some promotions and freebies that you might find interesting. If you know of other promotions that we missed, please let us know so we can update this post before the event! Frigidaire: A “blackout sale” on matte black stainless steel appliances will run from Aug. 17 to Aug. 23. The collection will be at least 30% off at participating retailers, including online. 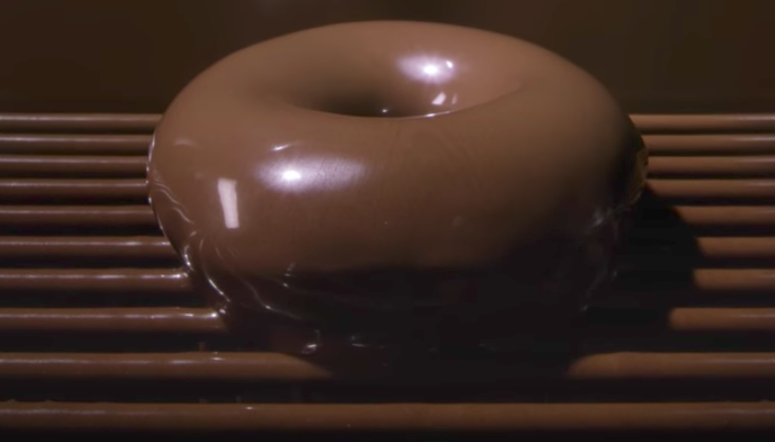 Krispy Kreme: The hot doughnut chain is celebrating the eclipse by putting a chocolate glaze on its original glazed doughnuts for the first time. “The Chocolate Glazed Doughnut is a delicious way to experience the solar eclipse — no matter where you are — and we can’t wait for fans to try it,” the company’s chief marketing officer said in a statement, leaving people who live in places with neither Krispy Kreme shops nor a full view of the eclipse bereft. Pizza Hut: They don’t have an eclipse special, but did make an instructional video showing how to make a pinhole eclipse viewer out of a pizza box. Dairy Queen: From Aug. 21 to Sept. 3, you’ll be able to buy one Blizzard and get one for $0.99, which somehow involves the eclipse. Warby Parker: While most places are out of the special viewing glasses you’ll need to protect your eyes during the eclipse, Warby Parker is giving them away for free at its physical stores. Or, follow these instructions to make your own pinhole projector [PDF]. U.S. Postal Service: The USPS is selling super cool eclipse stamps. They’re the first postage stamp in this country that uses thermocromatic ink that changes the image when you touch the stamp. The moon covering the sun disappears. Mistubishi: Appropriately enough, the company announced a new version of its Eclipse today, the Eclipse Cross. Nissan: The automaker expanded its “midnight edition” dark trim to three of its pickup trucks. Shake tequila and orange juice and pour into a rocks glass over ice. Mix charcoal lemonade and grenadine and slowly pour into the cocktail. The eclipse cuts a swath across the country from the Pacific Northwest to the coastal Southeast, so there’s no way we can include every big eclipse viewing event or post-eclipse party. But there are some handy lists out there. • Travel Oregon has put together this roundup things to do and see in the state on Monday. • Here’s a massive map of the 100+ events going on in and around St. Louis on the day of the eclipse. • This page at the Charleston Post & Courier site gathers together some of the best places to celebrate after the eclipse for people visiting the last city in the path of totality. • And USA Today has its guide to events both in and outside the path of the total eclipse. By air: Private plane operators and small airlines like Million Air have packages that will take you to a remote airport to view the eclipse for $10,000, according to Bloomberg News. Even private jet companies and commercial carriers like Southwest are giving away viewing glasses to passengers on flights that might get to see the eclipse from their windows. On the ground: The American Astronomical Society has a handy tool for looking up local events taking place along the path of the eclipse, from astronomy club meetings to community festivals and live streams. NASA: If you don’t live somewhere where the moon will completely cover the sun and/or will be stuck at your desk, NASA has you covered: It will be streaming the eclipse from a weather-proof vantage point above the clouds. The space agency expects up to a billion people to watch. The Weather Channel: Another option for watching the eclipse will be on The Weather Channel, which will be broadcasting live from seven locations across the country. SolarEdge: If you’re wondering who is seeing the eclispe right now, solar energy systems company SolarEdge is also offering a stream that will show you the path of the eclipse and how it’s affecting solar energy systems. Will The Total Solar Eclipse Affect Solar Power? Previous Could The Jeep Brand Cross The Ocean For A New Home In China?